10 Things To Do Before The First Day of School | So You Want To Teach? As the new school year approaches, many new teachers find themselves entering the ranks of professional educators for the first time. Maybe that’s you. Or maybe you’re a college student beginning your student teaching process. Or a new teacher who experienced a bit of frustration last year. Whatever the case may be, the new school year brings with it a certain sense of excitement and nervousness. 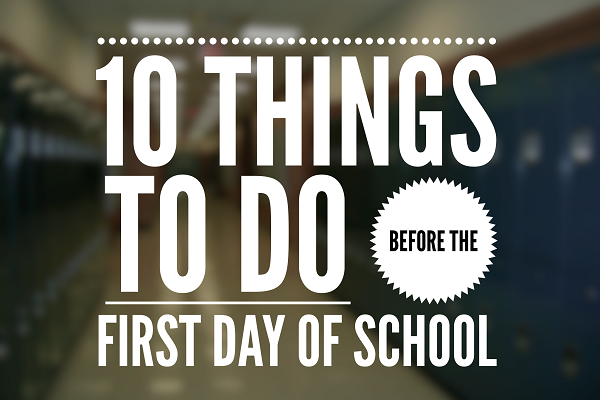 This article explores 10 things to do before the first day of school. Remember that the desks are not necessarily constrained to one particular setup and bookshelves don’t always have to stay against a certain wall. Make the classroom comfortable for you. You are going to be spending a whole lot of time here for the next 10 months. Maybe even the next 40 years. Make sure it is welcoming to the students, safe for everyone, and pleasant for you to walk into every day. This is a crucial first step in controlling your environment, and it will not be your last. How will they enter the room? What happens after they enter your room? What signals it’s time to begin class? How do we handle restroom privileges? When is it acceptable for a student to get out of their seat? How do we handle turning in paperwork? Is there a pencil sharpener? How should the students get your attention? Is interrupting allowed? What about talking without permission? Ever? Never? How do we handle a fire drill? How do we handle announcements during instruction? What signals the end of class? How do we leave the classroom? What happens to items that are left behind? You get the picture. There are a whole litany of procedures that must be considered. Successful teachers think these things through before they happen. How do you manage attendance? How do you keep track of grades? This doesn’t have to be anything elaborate, but it should be a hard copy that can at least manage a week worth of attendance. Computerized gradebooks are great, but sometimes the network goes down. And other times you just want to know where things stand. Remember in the olden days when teachers had hand-written gradebooks that included a spot for attendance and other notes? Why not bring that (or something like it) back? If you choose not to address this, don’t blame me when you get nasty phone calls and emails from the campus attendance clerk! You don’t know everything. I don’t know everything. Mr. Know-It-All doesn’t know everything. Smart people make lists of questions and seek our mentors. People who do what smart people do end up being smart people. Start a list right away of questions that you have. When you find the answer, write it down next to the question. This will be a valuable tool for you throughout your first few years of teaching. Later on when you are old and wise, you can pay it forward and pass your learning on to a young teacher. Peer teachers may include other new teachers that you meet in district orientation. They may also simply be other teachers from your campus that teach the same subject, or teach the same students, or teach the same grade. If you teach an elective, they may be teachers from another campus who teach the same or similar classes. Whatever the case, make friends. Learn about the curriculum. Learn about what expectations are set for you. Peer teachers are great for learning alongside. Find out who the top teachers on your campus are. For starters, these are usually the people who are department chairs or who lead staff development sessions. Get to know them. Get to know the school through them. They’ll tell you things the principal won’t tell you. They’ll tell you which of the staff members to avoid and which to befriend. While you’re at it, take that list of questions and begin asking them. Here’s the thing: Great teachers care enough to answer your questions. No matter how busy they are, they are interested in helping grow more great teachers. You will not annoy them. They have time for you. Just ask. If you feel like you’re being a nuisance, save some questions for another day. Later in the year, you may get to know more. Ask them some of the same questions. Each person has a unique take on things and you can never learn everything. Sometimes someone will say the same thing in a different way and we finally get what they’ve been trying to tell us all along. Seek help from as many sources as possible, oh wise one. Using your district’s yearly calendar and your curriculum, begin to plan out major checkpoints in your year. When should you begin reviewing for semester exams? Sooner than you think. Is having a major project due the end of the grading period wise? NOOOOOOOOOO. Figure out when concerts and performances and state assessments and whatever else might be. Plug them into your calendar. From here, I often will begin figuring out monthly goals. Having this will allow you to begin to see when you can plan specific projects or learning goals and still fit everything else into the year. You will undoubtedly be turning in lesson plans. These are often done a week or even month in advance. Reality never meshes with the plan. I keep a log of my ACTUAL lesson plans from year to year so that I can go back and adjust things accordingly the next year. You will thank yourself for doing this after about the first year of doing it. This is a big one. This is a scary one. There are so many things to do at the beginning of the year, so it is vital that you have a concise plan in place for the first week so that you don’t waste time. It also leaves the best possible impression with the students. The first school day will most likely be about a half day after school business and last-minute registration and every other nightmare possible finally happens. Hopefully you won’t have a fire alarm on the first day, but you probably shouldn’t be surprised if you do. It’s just one of those kinds of days. But the moment you plan to not get anything done, suddenly you will be blessed with one class for three hours and be expected to fill the time. What do you do then? I just continue and get started on Tuesday and Wednesday’s plan. Why? Because I have the entire week planned out. Welcome to the world of education. Good luck! You’ll be great! If you liked this article, share it with someone you know who needs to hear this. Share the infographic on Pinterest. Leave comments.